​​Arsenal welcome in the new year with a home fixture against Fulham on Tuesday afternoon. Both sides' fortunes seem to have changed over the past couple of weeks but in opposing directions. Where the Gunners seem to have regressed, Fulham are on the up after their appalling start to the Premier League season. One thing is almost guaranteed in this game: goals. The two sides have conceded a combined 73 goals in the league thus far and have struggled to keep clean sheets throughout. Arsenal go into this fixture having shipped five goals in their defeat to Liverpool, whilst Fulham boast the worst defence in the league. This one could be high-scoring. Arsenal have been riddled by injury at the worst possible time. The congested festive fixture ​list has taken its toll on the Gunners' squad, who are light on defensive options. Rob Holding is out of the game with an anterior cruciate ligament injury, whilst Hector Bellerin (calf) and Nacho Monreal (muscle injury) remain doubts. Unai Emery will also be without Danny Welbeck (broken ankle), Henrikh Mkhitaryan (foot injury) and Konstantinos Mavropanos (groin injury). Mesut Özil is struggling with a knee injury and is a major doubt for the London derby. Fulham, meanwhile, go into this fixture relatively untroubled by injury. Late decisions will likely be made on Alfie Mawson (knee injury) and Zambo Anguissa (knock) but both are expected to be fit for the game. However, Claudio Ranieri will be without Calum Chambers who is ineligible to face his parent club. Since the first clash between these two sides in 1904, this fixture has been played a further 55 times with Arsenal very much on top. From the 56 times Arsenal have played Fulham, the Gunners have come out on top 38 times and have lost just eight times. Arsenal are unbeaten in their last five fixtures against the Cottagers, with their most recent loss coming all the way back in 2012 when they were defeated 2-1 at Craven Cottage. However, this remains Fulham's only victory against the Gunners in the last 12 match-ups between these two sides. Therefore, history is very much on Arsenal's side going into this London derby. Whilst the Gunners might have history on their side, their recent form has been haphazard to say the least. Arsenal have won just twice in their last five fixtures, with one of these victories coming against Qarabag in the Europa League. In these last five games, Unai Emery's side have conceded a whopping 12 goals, with five of these coming in their last fixture against Liverpool. The Gunners' form has seen them slip outside the top four and they currently sit seven points behind their London rivals Tottenham. Fulham, on the other hand, have been steadily improving under Claudio Ranieri. The Cottagers have claimed five points in their last five games and have managed to keep two clean sheets, a feat they failed to achieve in their first 17 Premier League games. Whilst Arsenal have been poor recently, they will go into this fixture against Fulham as strong favourites. 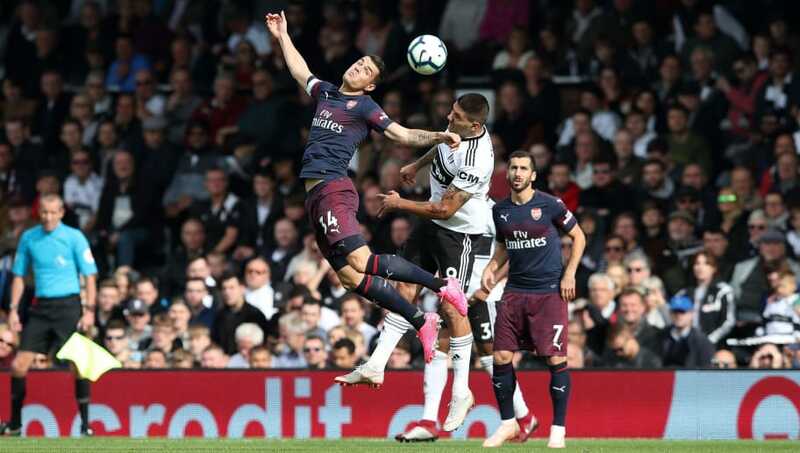 The reverse fixture saw the Gunners demolish their opponents 5-1 at Craven Cottage and Emery will be hoping for a similarly emphatic victory. However, Fulham have become a harder team to beat under Ranieri and have conceded just one goal in their last three games. With the warrior that is Aleksandar Mitrovic up front, the Cottagers will also fancy their chances of nicking a goal against this leaky Arsenal defence. Nevertheless, the Gunners will be desperate to get back to winning ways and this could spell the end of Fulham's three-game unbeaten streak.